For my get pushed challenge from David Tigani @dtigani - For your challenge, I'd like you to create a composite with at least 3 different photos blended together. The sunset is from 1st March, the time nd the termometer are from today (3rd March). 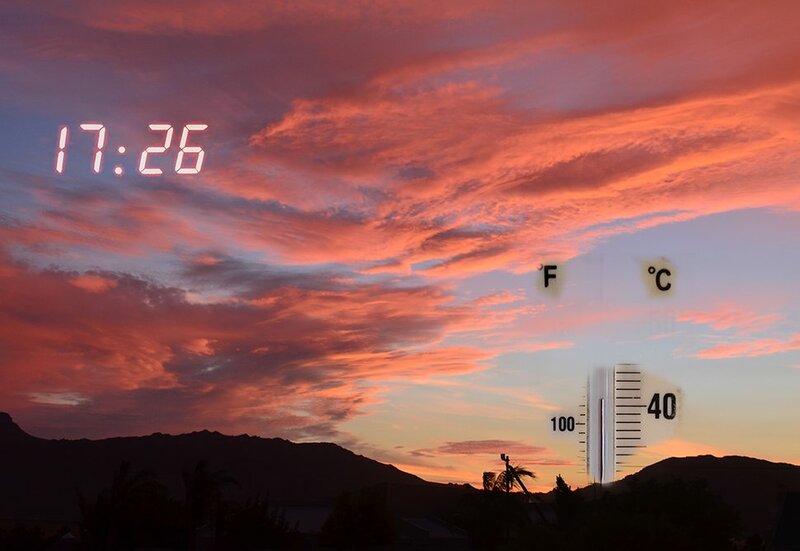 This also illustrates how hot it can get in the Tulbagh valley - it was 41C at 17h26. A day to be shut inside with the airconditioner going! @dtigani first one. I do have an idea for another one. Wow what a great idea! The sky alone would be a fav - with the originality of the temp and time data its just so cool. or i should say, so hot. interesting and clever composition of the 3 shots. Wonderful. You completed your challenge well! Wow! And I thought we were hot at 34C! I did however wonder what the temps were in Paarl and Tulbagh! Fabulous idea for a composite. Great processing and sounds like a very hot day! We are in -40 temp! This is REALLY clever! Fav for all the work that went into this and a great result. Very, very clever Sally. It has been hot recently. Oh my that is hot! Great color! brilliant Sally. I believe it was the hottest day in recorded history. ah, aren't you the clever one! this is a great depiction of your weather. That is hot!! If I ever do get to go to your area, I will remember to visit in the winter! !